two act plays fdor the amateur and professional stage. “twoactplays” aims to provide newly published works suitable for amateur and professional performance across a number of genres. This site will enable you to find,fairly quickly, a play that will be suitable for your group or production company. Click across the links at the top to locate the focus of work you are interested in, or just scroll through all the plays we have to offer page by page. We are always interested in expanding our base of new plays and are consequently delighted to consider new submissions. We would ask writers to contact us by e-mail in the first instance with a brief synopsis of the work they have produced. “twoactplays” is one of a number of sites developed by Brian Langtry, one of the Midlands most respected writers and performers, with a career spanning 4 decades. Brian has written extensively for the thatre and has recently branched out into film making. He was the creative force behind a number of recent nationwide touring productions ; musicals about Eva Cassidy, Billie Holiday and Connie Francis have all been countrywide successes. These can be found on the leglessproductions.co.uk site. Please click on the appropriate link above to go to our plays. Other sites which may be of interest to you are: www.giggetty.co.uk- a site devoted to the iconic Black Country folk group `Giggetty`. Brian was one of the founder members nad remained with the group until its demise in 1997. a career of over 25 years. `Giggetty` performed in concert, on TV, on radio and this site tells you everything you need to know about the group. www.leglessproductions.co.uk-this site showcases plays,films,productions that showcase new and original writing. You can find diverse approaches to drama,comedy and musical. Some of our plays/productions feature work about a variety of iconic stars: Eva cassidy, Marilyn Monroe, Dusty Springfield, Tallulah Bankhead, Billie Holiday, Johnny Cash and Janis Joplin to name but a few. www.oneactplays.org.uk-this site is devoted to plays of a one act nature across all genres and introducing new and established writers to amateur and professional production. www.filmsbybrianlangtry.com-a new site devoted to Brian Langtry`s recent move into film making with both documentary and drama available. One of these films is avalable on youtube: click here and scroll through videos. 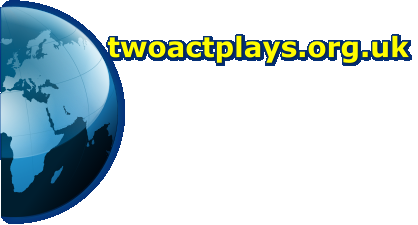 “twoactplays” aims to provide newly published works suitable for amateur and professional performance across a number of genres. This site will enable you to find,fairly quickly, a play that will be suitable for your group or production company. Click across the links at the top to locate the focus of work you are interested in, or just scroll through all the plays we have to offer page by page. We are always interested in expanding our base of new plays and are consequently delighted to consider new submissions. We would ask writers to contact us by e-mail in the first instance with a brief synopsis of the work they have produced. “twoactplays” is one of a number of sites developed by Brian Langtry, one of the Midlands most respected writers and performers, with a career spanning 4 decades. Brian has written extensively for the thatre and has recently branched out into film making. He was the creative force behind a number of recent nationwide touring productions ; musicals about Eva Cassidy, Billie Holiday and Connie Francis have all been countrywide successes. Other sites which may be of interest to you are: www.giggetty.co.uk- a site devoted to the iconic Black Country folk group `Giggetty`. Brian was one of the founder members nad remained with the group until its demise in 1997. a career of over 25 years. `Giggetty` performed in concert, on TV, on radio and this site tells you everything you need to know about the group. www.leglessproductions.co.uk-this site showcases plays,films,productions that showcase new and original writing. You can find diverse approaches to drama,comedy and musical. Some of our plays/productions feature work about a variety of iconic stars: Eva cassidy, Marilyn Monroe, Dusty Springfield, Tallulah Bankhead, Billie Holiday, Johnny Cash and Janis Joplin to name but a few. www.oneactplays.org.uk-this site is devoted to plays of a one act nature across all genres and introducing new and established writers to amateur and professional production. www.filmsbybrianlangtry.com-a new site devoted to Brian Langtry`s recent move into film making with both documentary and drama available. One of these films is avalable on youtube: click here and scroll through videos. www.bandedtogether.co.uk- a site devoted to the true sory of the Whitwick Coal Mine disaster in Leicestershire.